Detroit native Leonard Ruder graduated from Meinzinger School of Art in Detroit, Michigan in 1946. Following a brief sojourn at the University of Fine Arts in San Miguel, Mexico, Ruder enrolled at Cranbrook Academy of Art to study painting under Zolton Sepeshy. 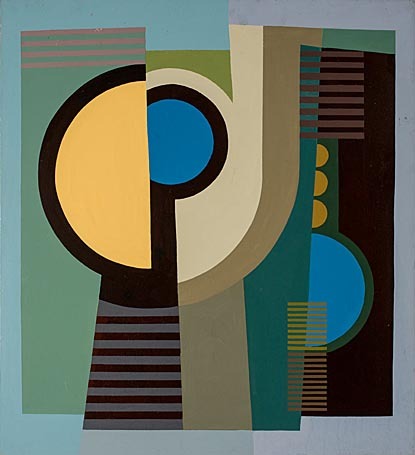 After graduating with his MFA in 1950, Ruder was included in a well-received traveling exhibition, Six American Painters, organized by the Institute of Contemporary Art in Boston. The same year, he moved to Portland, Oregon to attend the Portland Museum Art School. Planning to make a career out of painting, he took a day job as a custodian in a local school district to support his young family while painting in his home studio at night. Ruder continued working this way for the rest of his life, painting for over 50 years and exhibiting through the Portland Art Museum’s Rental Sales Gallery, and periodically participating in group shows at smaller galleries and museums. Ruder’s fascination with space & science, architecture & machinery, and philosophy & religion are revealed in his work. A retrospective exhibition of his life and work was presented in 2008 at The Art Gym at Marylhurst University in Marylhurst, Oregon.